Women who can’t sleep, have start and stop contractions (labor doesn’t seem to start and continue), feel achy in the pelvis, hips or back, or it hurts when baby kicks may enjoy the results of the following techniques for pregnancy comfort. Sleep on either side with a long pillow between knees and ankles, not just knees! Avoid constipation – drink 12 ounces of quite warm water first thing in the morning. Not tea; Water! Wait 10-20 minutes before tea or food. After a week, if still uncomfortable, seek a bodyworker such as an osteopath, chiropractor, myofascial, Maya massage (not the same as pregnancy massage), and craniosacral therapy. 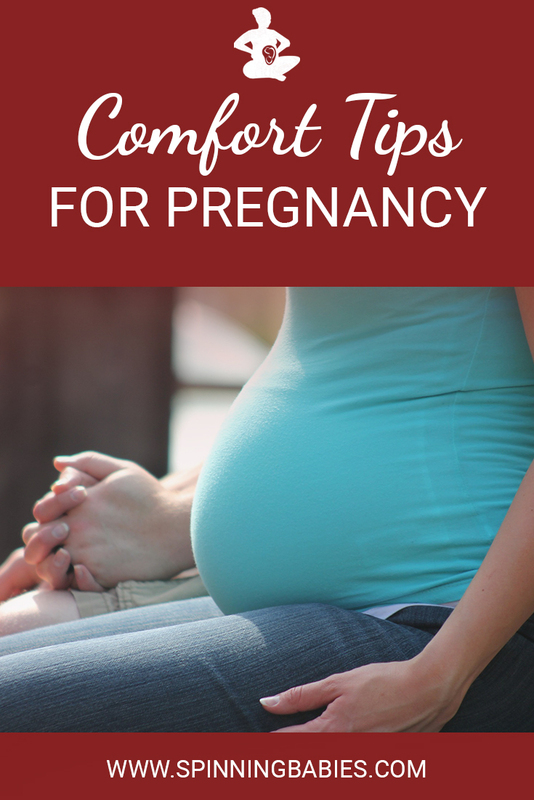 We also have a more detailed list of daily activities you can do to bring comfort to your pregnancy for free here or you can watch our Daily Essentials video, which leads you through 13 activities.